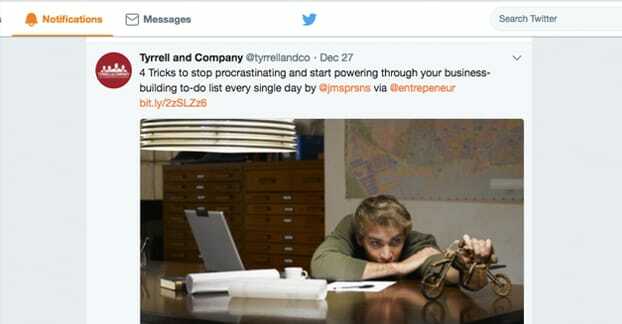 Keeping track of your presence on Twitter is actually a little harder than it seems. On the one hand, all you need is an active Twitter account and you’ll be able to see whenever anyone uses the @mention feature for your brand. On the other hand, that’s just the tip of the iceberg when it comes to mentions on a social network. Before we begin, I want to make one thing clear; there’s a difference between what we’re talking about and what Twitter calls Twitter Alerts. What we’re talking about here today is the idea of being alerted in some way when someone types your brand name in a post on Twitter. Setting up notifications in some way, through a dashboard or desktop alerts, will fill this role. What Twitter calls Twitter Alerts is more like a national notification system. You know how the radio and TV will periodically cut to color bars or a buzzing tone and say “this is a test of the emergency broadcast system”? Or how sometimes you’ll get a text message about a missing child in your geographic area? Twitter Alerts are a similar thing. Twitter heavily restricts which accounts can send Twitter Alerts, basically to just public safety accounts like FEMA and other similar organizations around the world. The general idea is to just use Twitter as another redundant location for broadcasting information in the case of an emergency. Various hurricanes, terrorist attacks, earthquakes, and other disasters like the ongoing Thomas fire in California can trigger local alerts for anyone who has subscribed to them. If you’re not able to access news through TV, radio, or the internet, it’s possible that a Twitter-pushed notification could still get through. 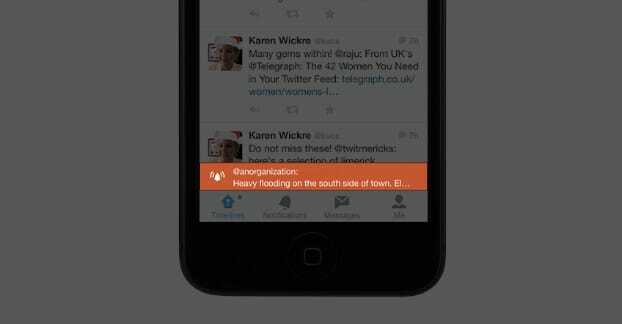 While useful for personal safety and for public safety issues, Twitter Alerts are not useful for a business. The chances of your business being able to push them are very slim, and the utility of receiving them isn’t valuable for marketing purposes. You could, I guess, use those notifications to keep on top of charitable support for local disasters, but chances are you’re going to get that information in other ways as well. Now, there are two ways that people can mention your brand on Twitter; they can do it using Twitter’s mention system, or they can not. For the purposes of this post, let’s say your Twitter account is @BrandName. It’s not, that account is a largely inactive Russian non-propaganda account that mostly retweeted a different Russian account focusing on interesting photography, art, and graphic design… but anyway. The point is, I’m going to use that one for reference. The key element here is the @ symbol. When a person on Twitter posts a name with the @ symbol, that becomes a link to that profile. More importantly, that mention, as it’s called, sends you a notification. For you on Twitter, you will see a new notification in your top bar. Click the top bar, and you’ll see a feed of all of the tweets that have mentioned your username recently. It’s worth noting here that mentions do not show up on your profile feed. If someone else visits your profile, they won’t see other tweets that simply mention you. All they will see are the tweets you make directly to your feed. When you @mention a brand on Twitter, it can show up in one of two ways, depending on where in the tweet the mention is. If the @mention is midway through a sentence, it’s a public tweet on their feed. If they start the tweet with the @mention, it counts as a reply, and is hidden from their feed. You can see the replies an account makes by clicking the “tweets and replies” tab on their profile. @Wendys is a good account to demonstrate this; they reply to incoming tweets very frequently, so you’ll see a very different feed between tweets only and tweets + replies. What about all of those times when someone makes a tweet that mentions your brand, or your product, but doesn’t specifically and explicitly tag you? If, instead of the above example, I tweeted “I got BrandName’s product two months ago and I couldn’t be happier with it!” you wouldn’t get a notification from Twitter. How can you find those tweets? It’s worth mentioning here that Twitter’s search will find all of the tweets that mention your brand name, with or without the @ symbol. You can, in fact, search for any keyword, brand name, name, hashtag, or trend and see a feed of those results quickly and easily. You can even narrow down those results by geographic location, time frame, and other modifiers. Search, though, isn’t a valid solution to our problem. Sure, you can run a search every few hours, and you’ll find any new tweets made that mention your brand name or your products, but that’s proactive. You need to go out and DO that search, and keep track of the results. You can’t be passive and wait for notifications, which is the idea. We don’t want to be wasting a lot of time running the same searches hour after hour, day after day, when there may or may not be any new results. There are a lot of different social media platforms out there that will help you track your social mentions. Most of them will work with more than just Twitter, which is an added bonus, but Twitter is generally the one you want to pay the most attention to. After all, Twitter is probably the best social network to use for direct customer service, as well as the standard social media marketing and influencer outreach. Sprout Social is one such social dashboard. 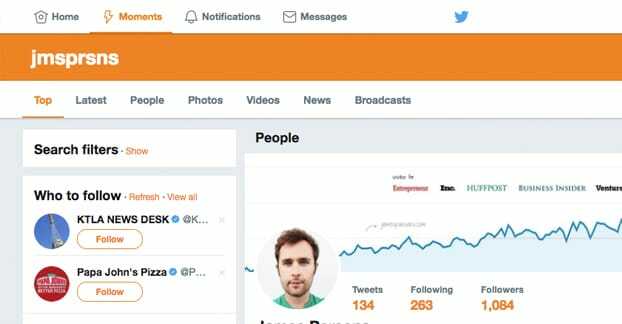 Hook it up to your Twitter account and it will monitor your account and searches for specific keywords you want to track. You can track your brand name, your product names, common hashtags you use, and anything else specific enough that you would want to see when it’s mentioned. One of the primary benefits of Sprout Social is that it’s real-time. When a new mention comes in, you’re notified and you can see it on your dashboard immediately. You can respond directly from there. Sprout Social also has the added benefit of maintaining some history of interactions with a given user, so if someone has repeatedly come to you with issues, you can see what that history has been. Sprout Social also has a bunch of team management features. 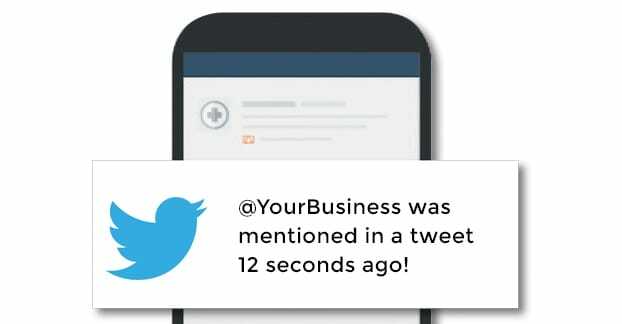 You can take specific messages and mentions and assign them to team members. For example, you might have a team member dedicated to leaving positive replies on positive tweets, and another dedicated to reaching out for customer service issues, and another who manages replies that people make using a contest-related hashtag. 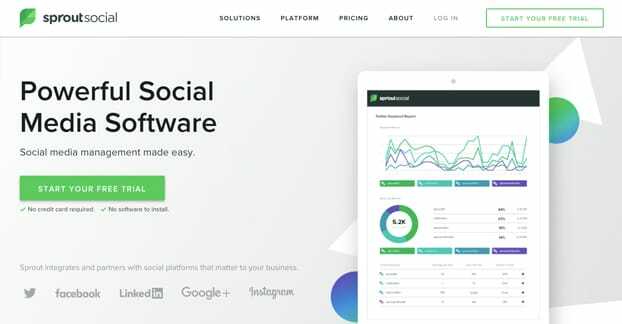 Sprout Social is a relative expensive platform, though a lot of features come with it. The cheapest version is Premium, which will cost you $99 per user per month and does not give you access to the advanced social listening suite. You get basic monitoring, but not the advanced tools. Zapier is another tool you can use, in a sort of do-it-yourself manner, to make a notification work the way you want it. Zapier is an automation engine where you take a trigger and an action, put them together, and let it happen. In this case, Zapier has a Twitter trigger that happens whenever a search shows a new result for a search term you specify. If that search term is, for example, your brand name, you can then get notifications whenever your brand name is mentioned. The action, then, is the kind of notification you want to set up. Zapier is very flexible, so you can use a variety of different actions. You can get an email for each new mention. You can use something like Pushbullet to have a push notification sent to your mobile device. You can even just have it feed into a Google Sheet or some other document for later perusal. The choice is yours. 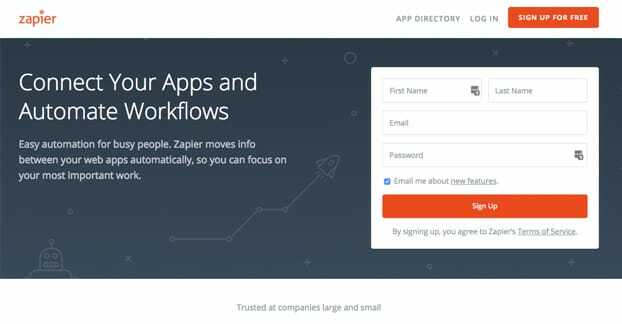 Zapier is free to use for two-step zaps, though you’re limited in the apps you can access. If you want access to all 750+ apps they integrate with, you need to pay for a membership, which starts at $20 per month. Such memberships also include data filtering options, priority support, access to 3+ step zaps, and a free month if you pay annually. All in all, it’s not a bad deal, though you do have to set up a different zap for each keyword you want to track, which can be tedious. 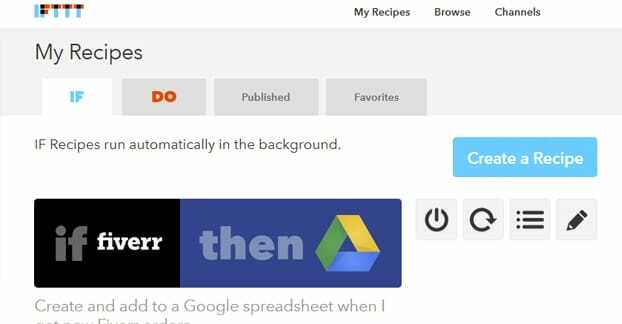 IFTTT is another such automation engine that has many similar features. I believe they have the same access to Twitter as Zapier, but the possible actions you can choose will vary. It’s worth checking them both out, to see which one better fits the workflow you would like to produce. Hootsuite Insights is another potential offering on the same scale as Sprout Social. 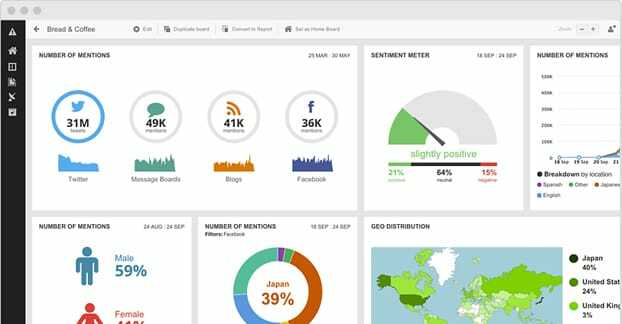 It’s a very comprehensive all-in-one dashboard that includes powerful social media monitoring. The social listening features tap into dozens of channels, including blogs, search engines, forums, and social networks. Twitter, obviously, is included. Insights is an extremely powerful tool. It gives you an unlimited number of reports that update your data automatically, and it includes a ton of analytics for that data. You don’t just see the notifications, you see the context, the sentiment, the demographics of the people leaving the messages, and alerts to help notify you of spikes in activity and other unusual changes. Hootsuite is an incredibly robust and modular platforms, so I’m betting you can find a lot of other features you would want as well as the sentiment analysis and social listening. All of the various communication management, onboarding, dashboards, and automation apps add more and more value. The one downside here is the expense. Insights alone is expensive enough that they don’t publicly list their pricing, which generally means three or four figures for mid-sized businesses. You can bet it’s not a budget-friendly option, at least. Hootsuite DOES have some budget offerings, but Insights is certainly not one of them. Of course, you can always go the simple route and use Google Alerts. Google Alerts is free to set up, and can send you an email when you’re mentioned anywhere around the web, which includes Twitter. It’s not Twitter focused, though, so it might not be ideal for your needs. Do you have a favorite Twitter-based social listening, monitoring, or notification app? Feel free to let me know. I like to provide a range of options for my readers, but it means I don’t necessarily cover all the bases as thoroughly as I otherwise could. Plus, who knows; maybe a new app has slipped under my radar, but not yours. I’d love to hear it!